Pisac stopped being a destination of the Sacred Valley to become a destination in itself, is one of the places chosen by people who visit the Sacred Valley of the Incas, there are even people who skip the City of Cusco (When they have visited it) to go directly to the city of Pisac, on the way to Machu Picchu or to spend some days in this incredible village of the Sacred Valley of the Incas. But why do so many people want to be in Pisac? For there are many good reasons. Pisac is an hour from Cusco, on the way to Machu Picchu, since centuries ago was a kind of checkpoint and control of the Valley that led to the Sacred City of the Incas. Pisac is the colorful village where the Sacred Valley of the Incas begins and in it you can have all kinds of experiences; If you want to have a real idea of what Pisac is, it would be good to spend at least 2 days, and maybe decide to stay forever. Pisac has many places to see, you will find lots of information about the Pisac market or its amazing ruins, but that is not all, Pisac has many other authentic experiences that you will not be able to experience anywhere else in the world, starting with the huge number of people from Everyone you find buying in this market. The small streets of the sunny village of Pisac are filled with old houses and handicraft shops, it has an exceptional market and some of the most amazing buildings built by the Incas; The hospitality of the people of the village and foreigners, who are no longer, will offer you one of the best experiences in the Sacred Valley of the Incas. Make sure to visit it soon, or at least before it becomes more popular, contact us at info@boletomachupicchu.com. The National Geographic refers to the ruins of Pisac, such as the Inca constructions that can not be lost after Machu Picchu; That means that if you are already on your way to Cusco, visit Pisac; You can see fantastic Inca structures in Pisac, residences, temples, ancient astronomical observatories and the largest ancient cemetery in South America. The best way to get to know the Inca ruins of Pisac, the best way to get to know Pisac is with an expert guide, who can explain the incredible characteristics of this ancient Inca town. If you are already planning your trip to Machu Picchu separate a time to visit the village and the ancient Inca city of Pisac. The art exhibit includes statues and sculptures that were made paying attention to all details, wrinkles tattoos and even hair; Dress, customs, beliefs of ancient Peru; The burials of the Paracas culture, armed Wari warriors, Inca rulers, was designed by a family of artists. The cultural contribution of each one of the artists of this family is different; An invaluable contribution to the artistic and cultural heritage of Peru. 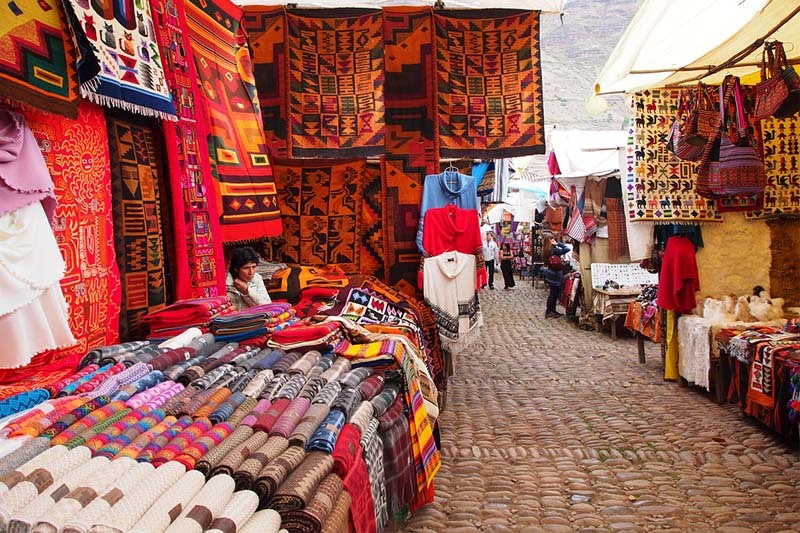 The Pisac Market appears as one of the best things to do in all of Cusco, and this city offers the best things to do in South America, so imagine; Or better stop imagining it and come as soon as possible. The Pisac market takes place in the Plaza de Armas and in the surrounding streets; Are hundreds of makeshift stalls, where you can find unique products made by local craftsmen and communities, jewelry and articles of gold and silver, garments and alpaca fabrics of the highest quality, can not leave Pisac without taking something from the market; But there is more, food, and some objects and concoctions that look like magical potions of healing; The prices are cheaper than in other artisan markets of Cusco. You can find handmade jewelry and souvenirs. On Sunday the market is full, people from all towns and communities come to trade their products; Is open from 9 am to 6 pm. The Chawaytire weavers community is 45 minutes drive from the village of Pisac and was created in an attempt to save the ancient ways of weaving the cultures of the Andes, to be transmitted from generation to generation, Here you can find high quality handmade fabrics on looms and spinning the wool of the Andean Auquénidos like the alpaca; But also will have the opportunity to interact with the weavers, to receive a few classes of artisan fabric for only 15 soles (US $ 4), and to know the way of life of these people and to support them; Is part of the practice of responsible tourism, and that will directly benefit the people who make these products with their hands. This community is located in the hills above the village of Pisac and is perfect for people interested in the ancient Andean textile. Here you can also see artisans weaving beautiful garments and other textiles in traditional ways; This community is located 40 minutes from Pisac village. Try to make this visit in the company of an expert guide.